In view of the increasing numbers of tourists and visitors to the island, infrastructure work is needed to address the problem of traffic jams. According to forecasts by the Department of Land Transport in Phuket, it is expected that this year will add more than 8,000 cars and almost 16,000 motorcycles to the province. This can mean as many as 24,000 vehicles on an island with an area of 543 sq. km. That equates to approximately 50 vehicles per square kilometer. A two-way tunnel is being built between Chao Fa West, near Home Pro Village Road, and Wiset Road, opposite the Muang Phuket School. The tunnel will be 300 meters long, and area road repair will cover about 1 km. The project cost is estimated at 800 million baht and is expected to take about 30 months to complete. The project start in 2016. The tunnel project of Kathu Patong has been in the planning stages for about four years, during which time the planned concept has changed several times. The final project will involve the building of two separate tunnels for traffic in and out of Patong. Tunnels in each direction will feature a separate lane for trucks and a separate lane for motorcycles. The entrance to the tunnel will include a 3.98-kilometer trestle at the beginning (at Phra Meita Rd., Patong) and the tunnel itself will be 1.85 kilometers long. The project’s budget is estimated at 6 billion baht. A Light Rail system is currently being planned. It will depart from the area of Ta Nun on the mainland and move toward Phuket International Airport, then continue south through Phuket Town and Saphan Hin, before passing along the Chao Fa East Road to complete the ring in Chalong. There will be 22 stops along the 60-kilometer route. The project is budgeted at 23.5 billion baht and is expected to start in 2021. 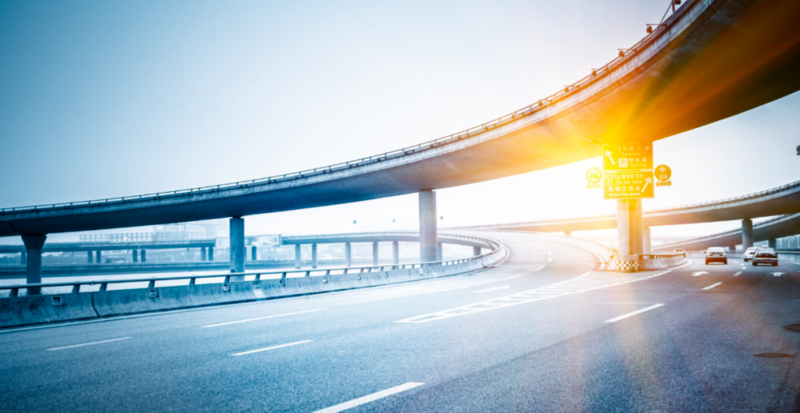 Two traffic-reducing fly-overs are in the planning stages. 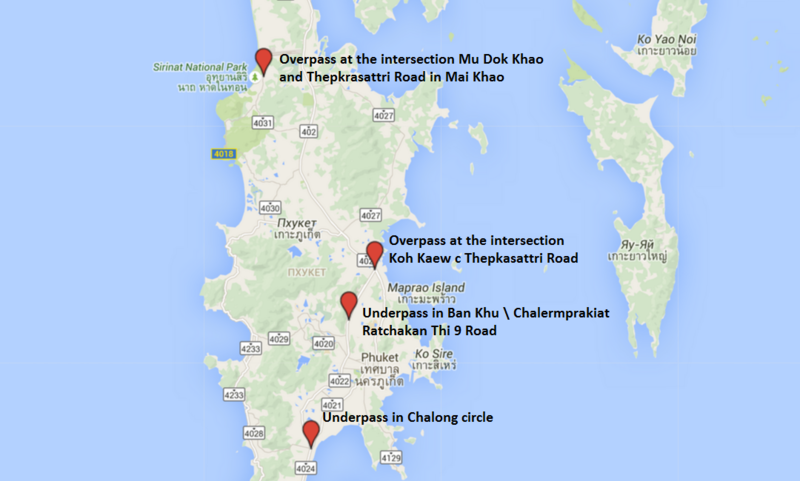 One is to be located at the Koh Kaew U-turn bottleneck and the airport road T-junction with Thepkasattri Road. The other is to be located at the Mu Dok Khao Intersection on Thepkrasattri Road in Mai Khao, where most of the traffic turns off to reach Phuket International Airport. The construction of these two flyovers is currently in the negotiation stage. In the event of a cancellation of these projects, the money will be redirected to other projects for the development of road and transportation infrastructure on the island. 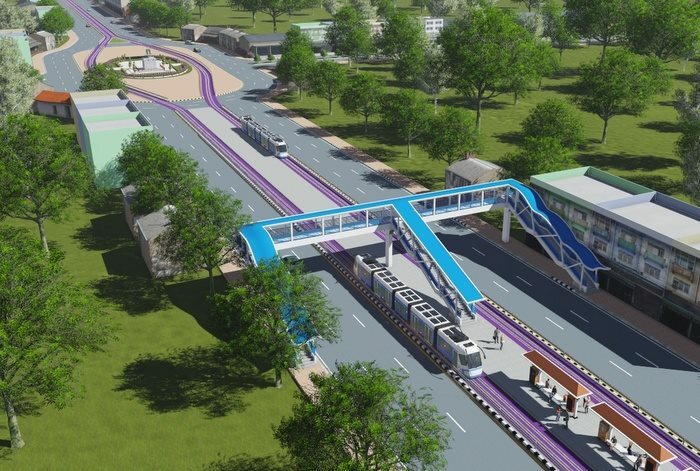 The flyovers will cost about 200 million baht. 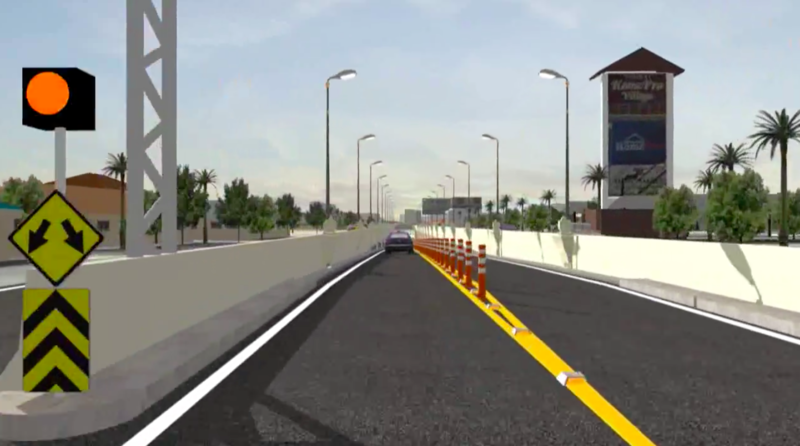 Construction has begun on the Bang Khu underpass, which will comprise of a two lane tunnel 790 meters long and 2.2 kilometers of road repairs. The budget for this project is 600 million baht. Aerial photo was provided by Richard Hearne.